Remark: Red ball stands for free oxygen, black ball stands for bacterial, organisms. 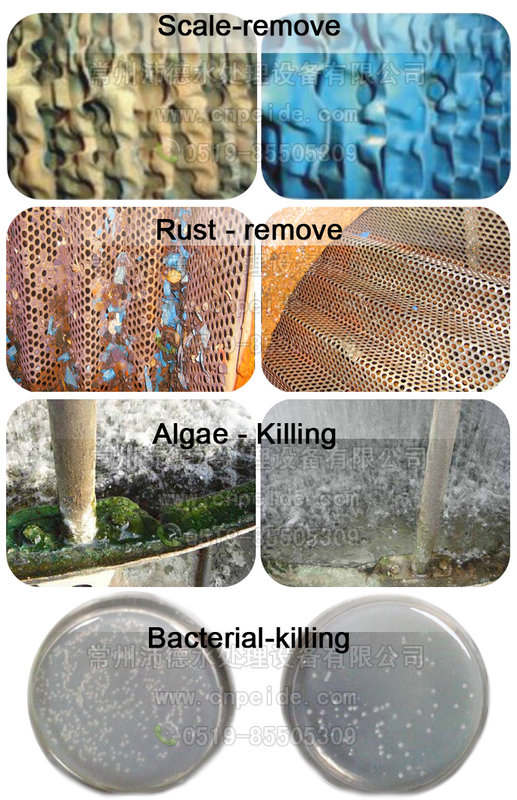 How does water scale harmful to equipment? 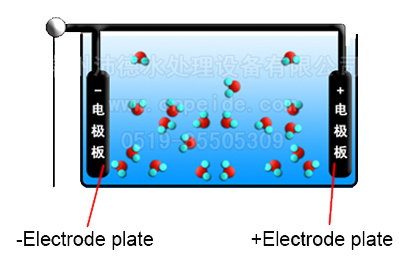 Water scale mainly consists of carbonate, magnesium, occupy 60%. Other kind scale includes sulfate, silicate, iron, occupy around 10%. Dust sludge around 30%. Scale largely reduce heat-exchange and reaction efficiency, which largely increase power consumption. Take center air-conditioning as example. 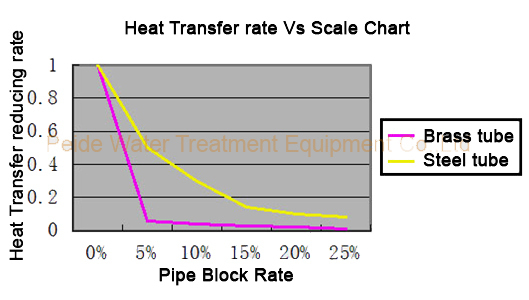 Once scale 0.3mm forms at heat ex changer will cause 20% heat loss, increase 10% energy consumption. Electrical descaler widely used at industry, agriculture, environmental protection field, and daily life. Example like: power plant, steel plant, cement factor, pharmaceutic, paper printing, coal and mining industry, etc. In center air conditioning, electrical descaler helps solve scale, sludge sedimentation, bacterial problem. Center air conditioning system used at factory, hotel, shop mall, office building etc. In heat supply system to solve scale, rust problem. Such like: electronic factory, module factory, heating supply system. In boiler water treating, it can replace ion exchange softener equipment. Electrical descaler can works under high efficiency, low power consumption. 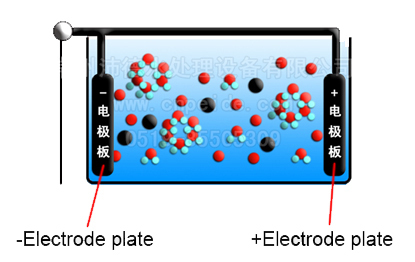 As of its constant working, which ensure constant electrolysis environment. It reduces over 4% power consumption. Easy to clean, no need drain,friendly to environment. Take 250KW center air conditioning system as example. Take 400RT air conditioning as example. Electrical descaler input power is 350W, only cost USD500 operation cost. Easy to clean as well, around 15M one time. Electrical descaler can separated chemical corrosion, long its lifetime. After using 2months, water can achieve best condition. Even if stop using for one moth, recycling water systemwon’t appear stop working or alarm. Small scale water supply plant, home well usually have high hardness, bad taste. Electrical descalerenables to reduce water total hardness, total alkaline and total bacterial cluster. It keeps drinking water clean and safe. Water water treating plant usually has troubles of fast sediment sludge. Electrical descaler helps to reduce treating cost, absorb most heavy metal ion meanwhile, kill bacterial, protect environment. 2.Keep control box as near electrode as possible, rain proof. 3.Don’t shut on/off frequently after connecting wire. 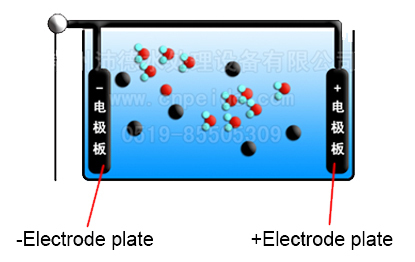 Wear protection glass, anti acid gloves when cleaning electrodes. Ask help for doctor if acid liquid touches skin.